A major source of wear and tear on your teeth is bruxism, which is commonly known as tooth grinding and clenching. This unconscious habit is often related to stress or to a misaligned bite, and over time can cause irreversible damage. To protect your teeth and relieve sore jaw muscles, the Arizona Periodontal Group offers bruxism treatment as part of our general dentistry services. Your tooth grinding may also be witnessed by a partner or family member as you sleep; the grinding noise is often audible to others nearby. One of the best ways to protect your teeth from clenching and grinding is to wear a custom-fitted night guard. This comfortable and safe appliance fits over your teeth to relieve the pressure they exert on each other while you sleep. You can also seek out counseling or stress management techniques to reduce your stress and therefore your tendency to grind your teeth. Dr. Trujillo can fit you for a night guard and also offer options and advice for treating stress. In addition to your night guard, there are a few tools you can use to help you relax your jaw. While unlikely to solve the problem alone, they are helpful additions to bruxism treatment. · Relax your muscles before bed with a warm, moist towel placed on your face or jaw. This can help fight the tendency to clench your teeth as you fall asleep. · Break habits such as chewing on gum and non-food items, which encourage your jaw muscles to tense. · If you grind your teeth during the day, consciously relax your jaw and place the tip of your tongue between your front teeth as a reminder not to clench them. · Reduce your alcohol consumption. Tooth grinding is more common after drinking alcoholic beverages. · Avoid items containing caffeine, such as coffee, tea, and chocolate. Caffeine is a stimulant, and can increase tension in your body. A healthy body and mind begin with a healthy mouth. Protect your teeth by taking measures to stop your bruxism today. 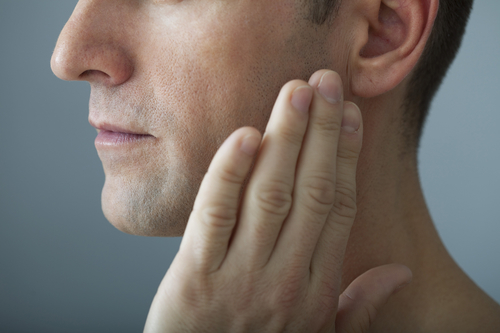 If you have caught yourself grinding your teeth or experience common symptoms of bruxism, call our office today, and let Dr. Trujillo, your Phoenix periodontist, help you.